1x WS-C4948 Switch with Enhanced 15.0 ios. Welcome to Rom Monitor for WS-C4948 System. Rom Monitor Program Version 12.2(31r)SGA7. Hardware Revisions - Board: 6.0 CPLD: 5 Dagobah: 226. The system will autoboot in 5 seconds. Prod: WS-C4948 part: 73-9130-08 serial: FOX1112. Power-on-self-test for Module 1: WS-C4948. = Pass, F = Fail, U = Untested. Port Traffic: L2 Asic Loopback.. Port Traffic: L3 Asic Loopback.. Use, duplication, or disclosure by the Government is. Subject to restrictions as set forth in subparagraph. (c) of the Commercial Computer Software - Restricted. Rights clause at FAR sec. (c) (1) (ii) of the Rights in Technical Data and Computer. Software clause at DFARS sec. 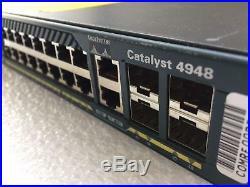 Cisco IOS Software, Catalyst 4500 L3 Switch Software (cat4500-ENTSERVICESK9-M), Version 15.0(2)SG11, RELEASE SOFTWARE (fc2). Compiled Mon 24-Oct-16 09:48 by prod_rel_team. Image text-base: 0x10000000, data-base: 0x123AECA8. This product contains cryptographic features and is subject to United. States and local country laws governing import, export, transfer and. Third-party authority to import, export, distribute or use encryption. Importers, exporters, distributors and users are responsible for. By using this product you. Agree to comply with applicable laws and regulations. And local laws, return this product immediately. Cisco WS-C4948 (MPC8245) processor (revision 0) with 262144K bytes of memory. MPC8245 CPU at 266Mhz, Fixed Module. 511K bytes of non-volatile configuration memory. NAME: "Switch System", DESCR: Cisco Systems, Inc. NAME: "Linecard(slot 1)", DESCR: "10/100/1000BaseT (RJ45), 1000BaseX (SFP) Supervisor with 48 10/100/1000BASE-T ports and 4 1000BASE-". PID: WS-C4948 , VID: V05 , SN: FOX1. NAME: "Power Supply 1", DESCR: "Power Supply (AC 300W)". PID: PWR-C49-300AC , VID: , SN: PAC084800J7. Chassis Temperature = 31 degrees Celsius. Chassis Over Temperature Threshold = 75 degrees Celsius. Chassis Critical Temperature Threshold = 95 degrees Celsius. Supply Model No Type Status Sensor Status. PS1 PWR-C49-300AC AC 300W good good n. Power supplies needed by system : 1. Power supplies currently available : 1. Power consumed by backplane : 0 Watts. Module 1 Status Led Color : Green. Power consumed by Fantray : 30 Watts. We will make it right faster than the case processing time! If your order includes console cable, please note limit One Console cable per order. These items are Government/Corporate surplus and we have no knowledge of prior use. Expect normal wear marks on all used items. We list them honestly and we list how it was tested. Guam, Virgin Islands, American Samoa. Please feel free to send any question. We hope this has been informative for you and thank you for viewing! 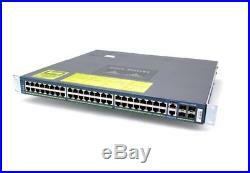 The item "CISCO WS-C4948 48-Port Gigabit Layer 3 Switch 4948-E 4948-S entservices-15.0 ios" is in sale since Monday, January 2, 2017. This item is in the category "Computers/Tablets & Networking\Enterprise Networking, Servers\Switches & Hubs\Network Switches". The seller is "future_nt" and is located in Lodi, New Jersey. This item can be shipped worldwide.